Take the ‘road less traveled’ near Kyoto during this laid-back full-day excursion featuring a scenic boat ride, train ride, and stop in the historic Arashiyama area. Enjoy a lazy 10-mile (16-kilometer) float down the Hoguzawa River before exploring the shops and shrines of Arashiyama. Finish with a ride aboard the Sagano Romantic Train and visit to the Mameya Kurobe souvenir shop. Choose departure points in either Namba or Umeda, and then meet at your agreed-upon staring location in the morning. You’ll travel aboard an air-conditioned coach to Kameoka to board a boat for a scenic float on the Hoguzawa River. Admire the views of mountains and blooming flowers along the banks, and listen for the croak of singing frogs in your ears, as you take a lazy 10-mile (16-kilometer) float down this scenic river. You’ll disembark and spend time exploring historic Arashiyama at your leisure. This well-known area just outside Kyoto is known for its lush bamboo groves, historic shrines and temples, and collection of interesting shops and eateries. 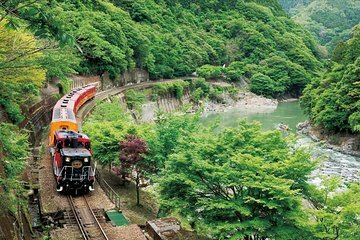 After your time in Arashiyama, meet up with your group and proceed on foot to Torokko Kameoka Station, where you’ll board the Sagano Romantic Train. You’ll have views of the Hoguzawa River below, along with a refreshing river breeze and the sound of buzzing summer cicadas. Return to the station and explore Mameya Kurobe, a renowned souvenir shop selling a variety of Kyoto-specific sweets and regional delicacies. After finishing your shopping stop, receive a ride back to your original starting point in Osaka. Infant (0-2 years old) are free of charge with no tour inclusions. Child (3-5 years old) price includes bus seat and the river boat trip fee. On the Sagano Romantic Train, the seat for a child is not included. Please hold the child on your lap or, if necessary, book your child as a "Youth". If the tour operator has to cancel the tour because of a typhoon, heavy snow or other circumstances beyond their control, this will be decided by 3pm the day before tour departure; you will be informed by e-mail and suggested a new departure date or receive a full refund. Delays and changes made to the itinerary due to traffic, weather or other circumstances that are beyond the control of the tour operator are not subject to a refund. This tour is operated for both Japanese and foreign customers. A Japanese tour conductor with an English-speaking staff will accompany the tour and will provide you with necessary information during the trip, but they are not responsible for providing any detailed introduction of attractions. Once the tour is set to operate, it will do so regardless of the conditions of the autumn leaves. Roads are expected to be heavily congested during autumn leaves season which might affect the itinerary including omissions or shortened visiting times and a delayed return to Osaka. Should the Hozu River cruise be suspended, a refund of the group boarding fare will be given and the visit to Arashiyama will be longer. The cruise will be 1.5~2 hours long depending on how high the river is. The cruise will run when it's raining as boats are equipped with a collapsible roof. Seats on the Sagano Romantic Train will be allocated on the day. Requests aren't accepted. The tour bus will be picking up guests from other meeting points before reaching yours. As a result, the bus could be running late but please be patient and wait. The tour end point might be different from the starting point. Please ask a member of staff on the day.